Great leaders have a number of qualities in common. They’re committed to their company and their team, they’re excellent communicators who are compassionate to employee issues, and they know how to make tough calls in high-pressure situations. Some leaders are born with these essential leadership qualities, while others spend years working in the trenches of different companies before they have a chance to show off their leadership capabilities. Regardless of how you became the leader you are today, it’s crucial to continue educating yourself. 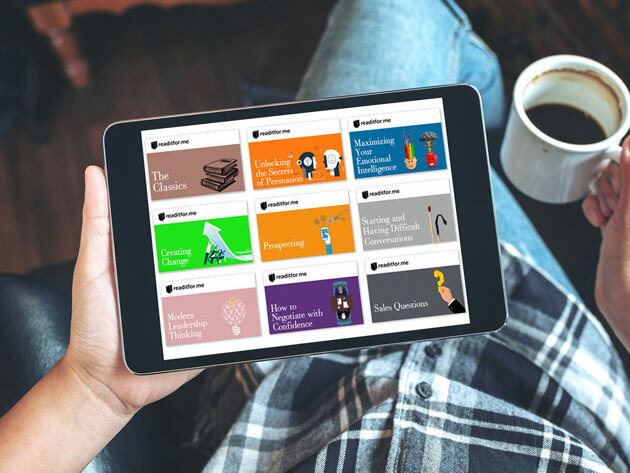 Readitfor.me offers summaries on hundreds of business strategy books, and its membership plans are on sale right now. Readitfor.me is the number one book summary service for entrepreneurs, executives, and business coaches. The membership is built to help you improve as a leader by offering summaries of the best leadership books around. You’ll have access to more than 300 essential business books, including recent best sellers and classic office reads. If you’re facing a specific challenge in your workplace, Readitfor.me has you covered. Is your team struggling to meet important deadlines? Check out Readitfor.me’s summaries of books on productivity. Challenging discussions with your team will be a piece of cake after you check out Readitfor.me’s summaries on tough conversations. Readitfor.me isn’t the only book summary service around, but its quality sets it apart from the competition. The summaries are written with care, pulling out essential details that you need to succeed from the best leadership books around. If you’re a visual learner, the service also provides animated video summaries. Curated collections of book summaries help you solve specific management problems, so you won’t waste time wading through pages and pages of irrelevant information. Readitfor.me has three different available plans. The one-year membership usually costs $228, but right now it’s available for just $29 (87% off). A five-year membership to Readitfor.me is available for just $99 (91% off the sticker price of $1,140), and a lifetime membership is marked down from $2,280 to $199 (91% off).